JA Job Board is a commercial extension. Get Your License NOW! You have a 7 days no question asked money back guarantee if the extension does not make you instantly happy. You already have an account on JoomlArt? Download now! 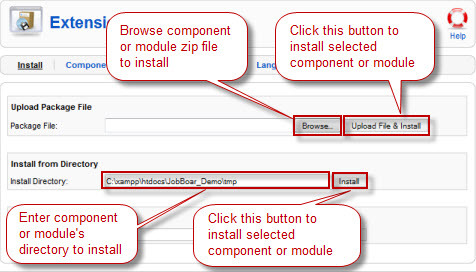 Follow the below step by step guidelines to download and install JA Jobboard component. Please note that JA Job Board does not require ioncube loader. First let's explore the extension download folders. We have updated the Downloads section to provide several installation packages with changelog and easy cross check links. Check it here on this link. the Quickstart installation package holding all extensions used in the Demo server. template - is the latest version of JA Purity II template. JA Jobboard distribution is partially encrypted, thus a ionCube Loader is required to read encrypted files. If ionCube Loader is not yet available on your server, you have to install and configure ionCube Loader first. *Extract ionCube files to ioncube folder under your webroot folder. *From web browser, load path to file ioncube-loader-helper.php of the newly added ioncube. *Add lib file path to php.ini as specified on ioncube-loader-helper.php. *Restart your server and refresh ioncube-loader-helper.php to make sure ionCube loader is loaded correctly. Step #2 Login to your Joomla! Administration Panel. Step #3 From 'Extension' menu choose 'Install/Uninstall'. 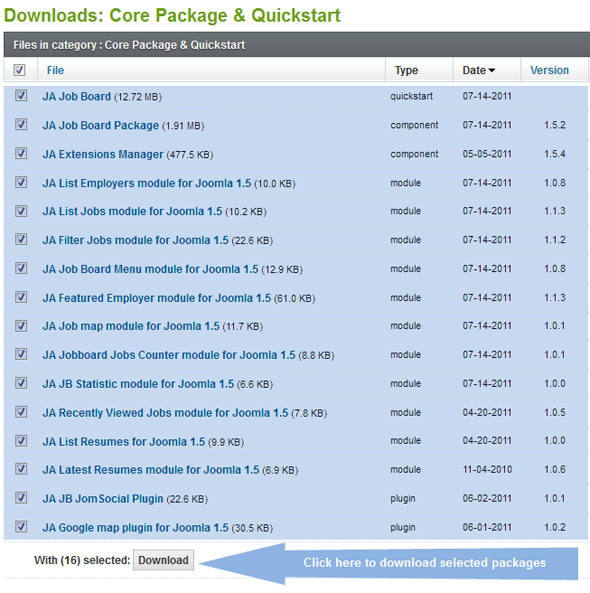 Note: From Jobboard version 1.5.x, you will have to install only "JA Job Board package", because all the modules and plugins mentioned in the Download section are embedded in the component --> Once you install the package, the modules and plugins are also installed as well. Step #4 Upload Package File from your desktop. In the 'Extension Manager', install each module and component from its folder. Please note that size of com_jajobboard package or other module packages are maybe greater than 2M, so you should install these modules and components form extracted folders. If you successfully install the component, you will see a Success confirmation message on the screen right now! Before getting Job Board modules configured, please change Joomla default's template to JA_Purity to display modules more clearly. JA Job Board component includes the following modules to be configured accordingly. Note that Job Board must be activated before any configuration is made to modules. No This module displays list of employers that are marked as “featured” on their account details on front-end. No This module let front-end user filter jobs by locations, categories,… This module only works on jobs list page. Yes This module is of great importance to Job Board as it creates navigation menus for different types of front-end users. Yes This module displays list of the latest resumes on front-end. Yes This module displays all employers on front-end. This module can be displayed as a tab of JA Tab module if JA Tab is installed. Yes This module displays a number of jobs or premium jobs on front-end. This module can be displayed as a tab of JA Tab module. 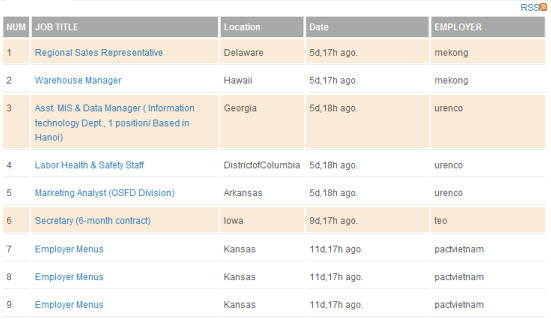 No This module displays recently viewed jobs. If viewer is an employer, this module does not display viewer’s jobs. No This module show jobs on Google Map, This module will show all of jobs in location that you selected in "Show jobs in location" params on Google map. This module will create specific menus for specific front-end user types. To configure the module, please follow the steps described in the image below. 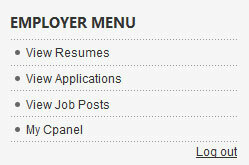 Employer Menus: Menus for employer users. 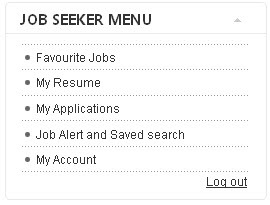 Job Seeker Menus: Menus for job seeker users. 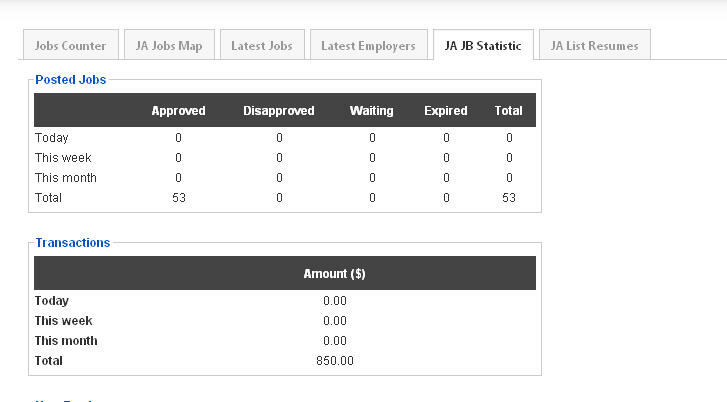 JobBoard User: Menus for registered users whose information have not been updated & approved by admin. This menu looks the same as the one for Job-Seekers. Example of this module on front-end. 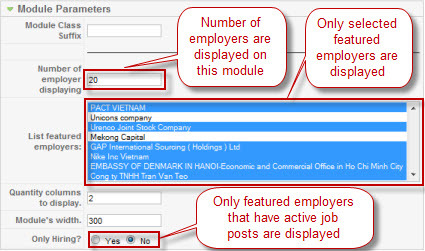 Number of employer displaying: The number of featured employers are displayed. 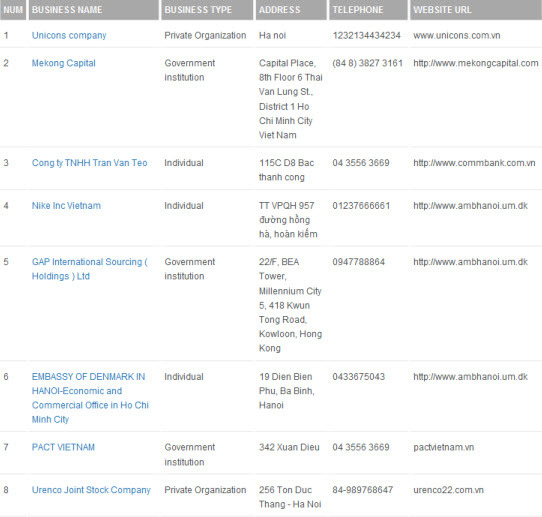 List featured employers: only selected featured employers on this list are displayed. Only hiring: If set to yes, then only employers whose job postings are still open & published for application will be displayed on featured list. If this value is set to no, then this module does not care about job posts. How this module is displayed. If visitor clicks on Location link. This module allows front-end users search jobs on jobs page. 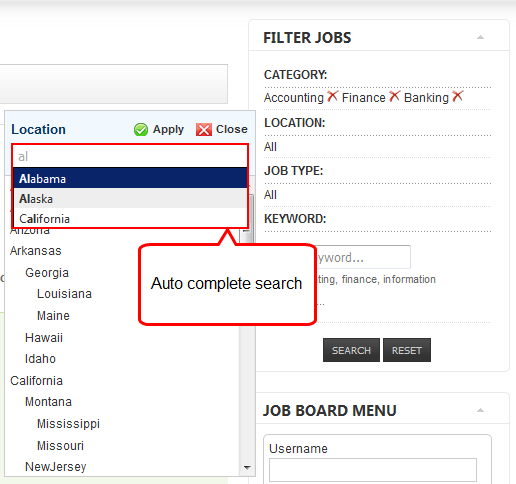 To search jobs, click on module links to open filter popup window, select the search critical, then hit apply button. The popup windows can be displayed on the left or the right of this module depend on this module's setting. 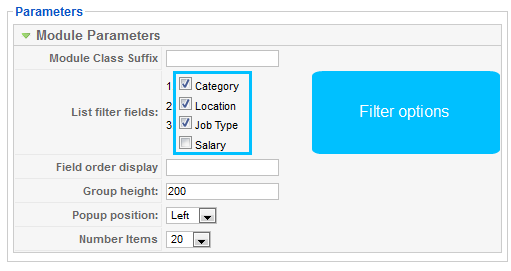 Set single select fields that you want to be filterable display on List filter fields by customize job form. Note that only single select fields can be displayed. Set Field is on filter: property of field that you want to be filterable, to yes. Select fields that you want to display on this module from List filter fields. You can set the order of these fields by enter fields' number in order that you want to display on Field order display. 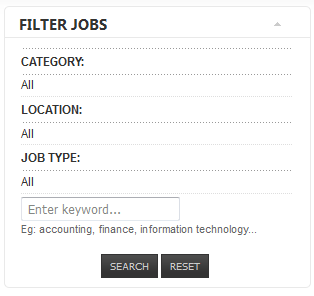 Note: The filter will return jobs in all sub sub-locations of selected location. How this module displays on front-end. This module displays a number of new job seekers as specified on module parameters section. Each job seeker is displayed with information such as photo, full name as a link to his/her resume. You could only control/edit the number of new job seekers to be displayed on this module. 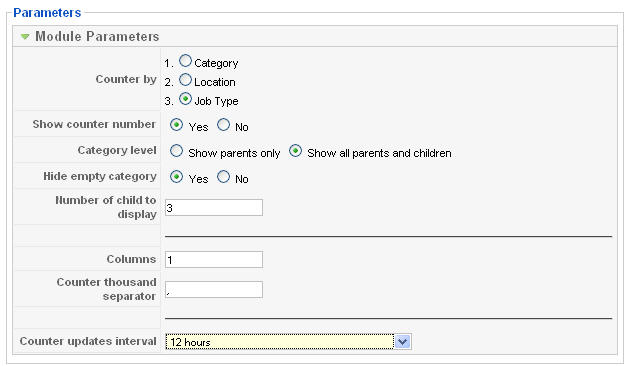 This module can be configured to display all employers or just featured employers by setting mode parameter accordingly. Please visit configure featured employers for more information about Choose featured employers and On hiring parameters. This module displays a number of jobs on front-end as specified on this Number Items parameter. Jobs on this module can be latest jobs or can be hot jobs (premium jobs) depending on Mode parameter. You can configure which columns are on this list by clicking on customize job table. There's no parameters to control this module. Note that if employer viewed his or her own jobs, then these jobs will not be displayed on this module on that employer's screen. This module is used to show the statistics of jobs divided into categories, location or job type. 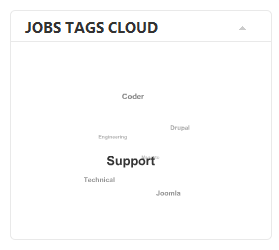 This module is used to show tags cloud that allow user to find job easier by select tag (when creating job, user can add tags for this job). Module Class Suffix: a suffix class to be applied to Css class of the module. This allows for individual module styling. Width: set the width size of the module. Height: set the height size of the module. Scale X: scales the width of tag cloud by factor i. If scale_x = scle_y, the tag cloud is round, otherwise oval. Scale Y: scales the width of tag cloud by factor i. If scale_x = scle_y, the tag cloud is round, otherwise oval. Text Font-size max: set the max font-size of text. Text Font-size Min: set the min font-size of text. Text Color 1: text of tag which is higher frequency. Text Color 2: text of tag which is lower frequency. Highlight Color: color of tag when selected. Background color: background color of flash movie. Transparent: select to enable transparent for the background or not. Speed: set the speed of text movement. If this speed is high, then user is hard to select tag. Distribution: if Yes then active items when mouse over. Open link in: select to open link in same window or new window. 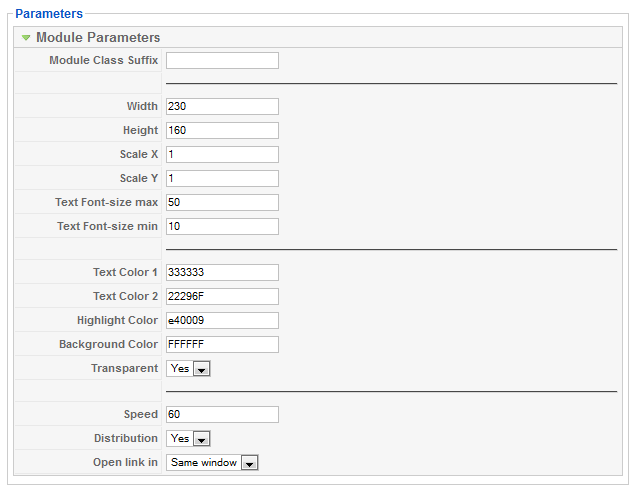 Number items: set the maximum numbers of items to be displayed in front-end. Theme Name: select one theme from the available ones. Resume Type: select to display All resumes/Featured resumes or not featured resumes. Resume Listing Order by: select basis to order item in front-end by Latest Resume or Most View. Job Board already has a component that display all active jobs, but there is no link to that page for now. 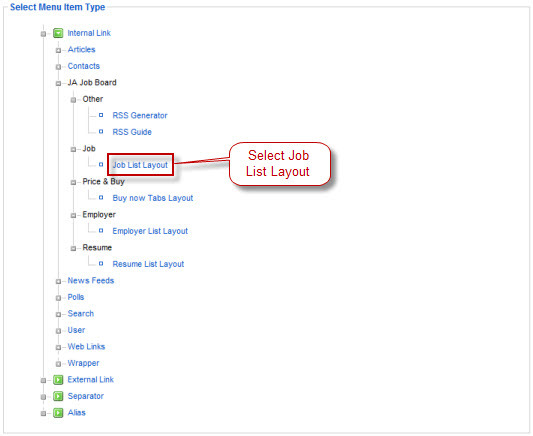 To create that link, you should create a main menu item links to all active jobs page, set Job List Layout for Menu Item Type. 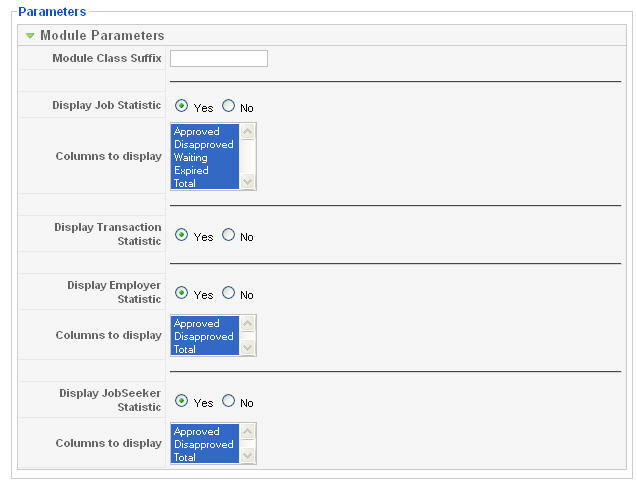 You can configure which columns are on this list by customize job table. If you want to your site can be display in multiple language, then you should install JoomFish componet. To get JoomFish, please download it from [| JoomFish download page]. This step requires step #9. Copy extracted files of joomfish_jobboard.zip package to under <site root>/administrator/components/com_joomfish/contentelements folder. w.e.f. 01/04/2010 JA JobBoard component is no longer domain restricted. It has been re-released under GNU/GPL V3 license - http://www.gnu.org/licenses/gpl-3.0.html . The component no longer uses any encryption and is open source. JA JobBoard has been released under GNU/GPL V3 license w.e.f 01/04/2010. It can be used unlimited times on unlimited domains. Warning: Before upgrade please perform full backup of your site. For older versions of the component, you will have to find the uploads folder located in site_root/components/com_jajobboard folder to back-up and re-upload after you install the new version of the component. If you upgrade to versions 1.4.3 or above, you can upload this folder elsewhere outside the component to avoid deletion by mistake. To eliminate difficulties with component upgrade and back-up of the front-end user uploads, the JA Development Team changed the component to make it capable to manage user uploaded files in the Joomla! root folder, so outside the component installation folders. Starting versions 1.4.3, JA Job Board uses images/stories/jbuploads folder to be used for user uploads, but you can create a new folder for instance images/stories/your_desired_folder_name and configure it (click here to see how) to be used for user uploads. The Upgrade procedure for all Joomla! extensions have changed! Please refer to this documentation section on how to upgrade the JA Job Board component with JA Extensions Manager Component, but keep in mind the classic upgrade steps below as they might help you find out why something went wrong on upgrade process. Click here to see video below to see JA Extensions Manager in action! 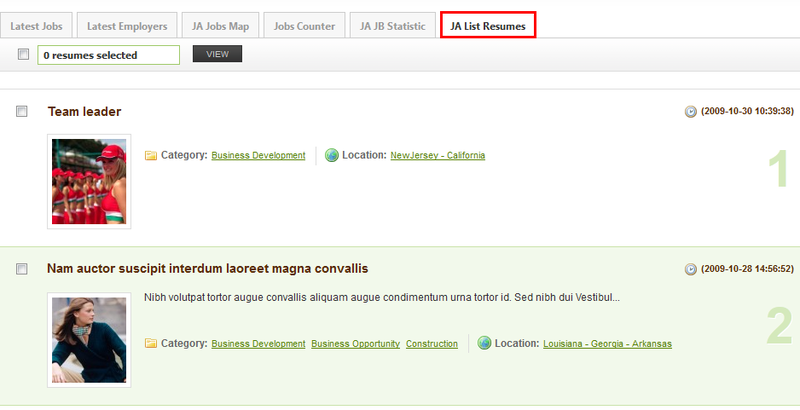 Select JA Job Board and click the Uninstall button to uninstall com_jajobboard component. Now click the Uninstall button to uninstall the selected modules. Please refer to installation to install these modules and component. Please refer to Configure Job_Board_Menu on how to configure mod_jajobboard_menu module. 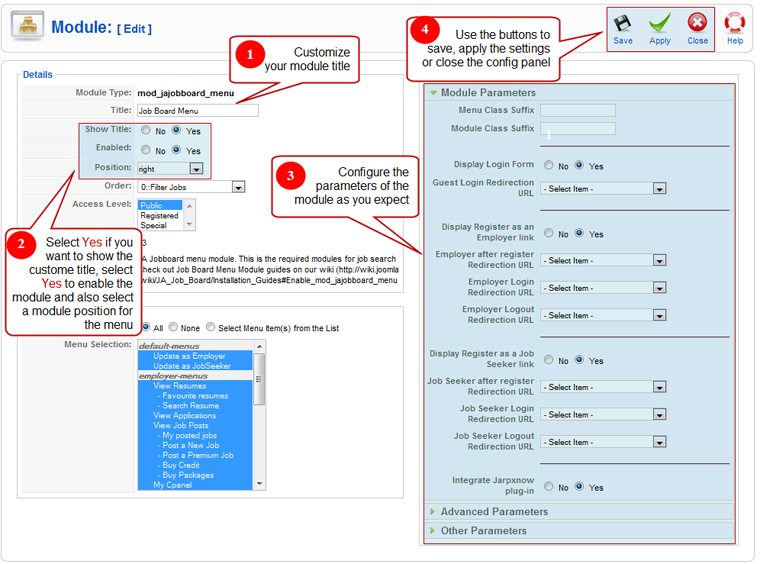 Please refer to Configure Featured_Employer_Module on how to configure the mod_jafeatured_employer module. Please refer to Configure Job_Filter_Module on how to configure mod_jafilter_jobs module. Please refer to Configure Latest_Resume_Module on how to configure mod_jalatest_resumes module. Please refer to Configure Employer_List_Module on how to configure mod_jalist_employers. Please refer to Configure Job_List_Module on how to configure mod_jalist_jobs module. Please refer to Configure Recently_Viewed_Job_Module on how to configure mod_jarecent_viewed_jobs module. Restore uploads folder under site_root/components/com_jajobboard folder from previous backup to another folder of your website, let's say your_site_root/jbuploads, and then configure this to be the uploads folder. If you applied any customizations to the previous version, you will have to re-apply them for the new version if necessary. Also, you will have to re-upload your customized language files. Note: From Jobboard version 1.5.x, you don't need to uninstall then install modules and plugins in the STEP 3. 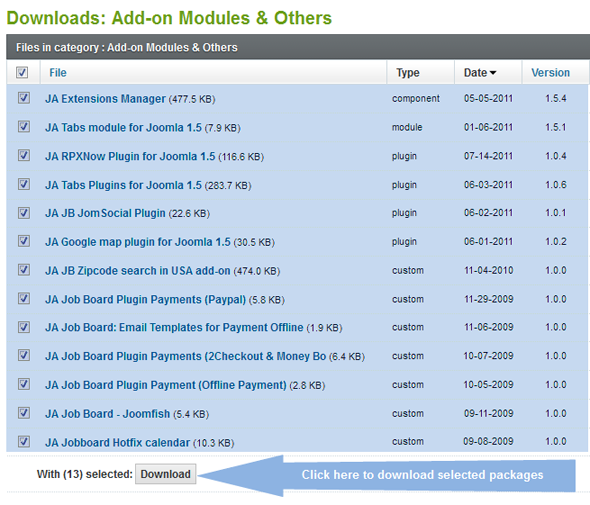 The update of JA Job Board package will also update for modules and plugins. Supposing you have customized your frontend view of the component and modules, you can easily update your code using a WinMerge or any other file/folder compare solution.